Through the years I tried many carrot cake recipes but never found one that came out perfect each time. A family friend K, passed this recipe on to my mother and she shared it with me. I found that it always turned out perfect. 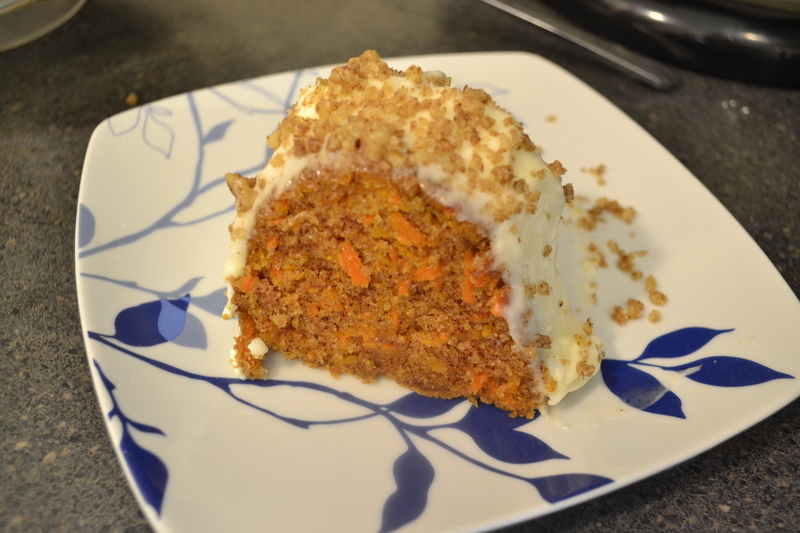 It has been my favorite carrot cake recipe for the past 20 years. It is a very basic recipe and you can add walnuts, raisins or whatever you want. Use a tube pan or two round cake pans. Lightly grease and flour pan. In mixing bowl put sugar and eggs, mix well. Turn mixer speed to low and add oil. Mix until well combined. Add dry ingredients. Remove from mixer and fold carrots in. Pour batter into prepared pan. Bake for 45 minutes. Cake is done when toothpick comes out clean. Remove cake from oven. When cake is completely cool remove from pan. Let cake cool completely and dust with powdered sugar or frost with cream cheese icing. Mix all ingredients in mixing bowl until fluffy. I love carrot cake! My absolute favourite! This is the best basic recipe I have found and have used it for years. My kids make it all the time now. I’ve been wanting to write a post on carrot cake but got carried away with end of school year calendar. Now on holiday, without my computer so I’ve have been quiet these days! haha well it’s nice to meet you! Nice to meet you too!! I love people who communicate! yes me too! otherwise it’s like you are off in space writing stuff to noone! Love your variety of recipes, some of them are very familiar like Graybeh and others new to me! Graybeh must be, right? I love how light and soft they are. yes sorry my spelling might be wrong. Yes it is light and delicious! I will try your recipe! Next time I make these I’ll try and add orange blossom or rosewater to the dough… Might be interesting! Thanks KoKo! I will try ice cream sandwiches and hanging my mugs! This looks great, Lynz! I’ve been searching for a no-fail carrot cake recipe for Thanksgiving and I think I’ve found it! Thank you! I absolutely love carrot cake and this recipe looks great. I find restaurants have a wide “variety” in taste and texture and am pretty picky about what makes a good one. Still trying to convert the wife. She’s ok with a taste or two but I’m the one that cleans the plate clean! We have made a few at home and looking forward to trying this one. It is very basic Bruce and that is why I like it. I have never had it fail, ever! Thanks for stopping by!